Here we present reviews of the most exciting traditional music and dance. Music takes me back to places I have visited. Collecting music from around the world is my big hobby. After a journey I enjoy listening to music from the places I have been, relax and work through my memories. Each country has its own unique music, and that`s make it more interesting. Photo. 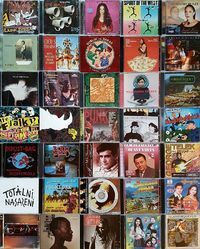 Some of my collected CDs from around the world: world music, folk rock, ethnic, traditional and folk rock. I really like ethnic music, world music, folk rock and traditional music. By listening these songs in my home, I sometimes feel transported back to the places I have visited. Wether I buy the music on cassett, CD, download or streaming, I find good memories from it. 'Listening to music is complicated. It’s said to be one of the few activities that requires using both sides of the brain simultaneously, according to an article I read on Internet. Music is for me brain therapy and it helps to retain my memories from journes around the world. For me world music is associated with traditions, culture, history, fairytales, dance, partying and happiness. All cultures have music. The oldest known musical instrument is a 40,000 year old flute carved from a bone. Music has been universally used to help people remember language and stories significant to that culture. Đorđe Balašević is a prominent Serbian and former Yugoslav singer-songwriter. I listened to his beautiful songs and drank home made wine in a pub into a cave. It was benath the fortress in Belgrade. The Fialka and Totalni Nasareni in Bratislava, Slovakia, in 2016: two legendary punk bands from Checkia turned the attenders upside down, sing along, jumping like wild cangooros and strange dance movements. Indust Bag: legendary Slovenian punk/new wave, and later more rock band, from Metlika in Bela Krajina, started in 1979. First bigger concert was at Novi Rock '81 in Ljubljana. I experienced them in Ljubljana in 2015 in Metalkova. Spirits in the West, Canada: every evening we sang along on the song "Home for a rest" at the Crocodile Bar. Voz Propia, Lima in Peru: enjoyed a concert the underground band performing punk music with strong lyric punch. Music from the Far East. Ethnic music the traditional and typically anonymous music that is an expression of the life of people in a community. Synonyms are folk, folk music. By collecting music from the places I have been, it`s my way retain my memories. Enjoying the music it`s like travelling back in time and it put me in the best mood. An article on BBC: Why does music evoke memories?